Suspension losses often are overlooked, but they are an important factor in tire performance. When we first tested the performance of tires in a roll-down test, we found that very high pressures offer almost no improvements of performance. This contradicted the testing done in laboratory settings on steel drums, so we looked for an explanation. We realized that suspension losses did not occur on the smooth steel drum. The steel drum tests left out one important factor, and therefore underestimated the resistance of the tires. What are suspension losses? When the rider’s body vibrates, there is friction between the tissues. This friction creates heat, and the energy no longer is available to move the bike forward. Suspension losses were a well-known factor around the turn of the 20th century, when riders still remembered what it was like to ride on airless tires. Not only were they uncomfortable, but also very slow. Finding the two surfaces was the tricky part. At first, we thought of the chipseal overlay that is found in some places around the Olympic Peninsula. There, the road originally was very smooth, but then the main road surface was repaved with rather rough asphalt. The original smooth pavement remains exposed on the shoulder. The problem was that these roads are more than 100 miles from Seattle, and since we needed perfect conditions with no wind, we might have to camp out there for days or weeks until we could do our testing. So we found a flat section of new highway with very smooth pavement, and rumble strips, and went out on a calm day to test. First, we went to some “standard” rumble strips and found that the additional power required to maintain 16 mph was 290 Watt. On the smooth pavement, the rider put out 183 Watt, on the rumble strips, they needed almost three times as much power (473 Watt). In fact, it was almost impossible to keep the bike going at that speed over the rumble strips! This showed that under extreme conditions, suspension losses can be huge. Then we moved to shallower rumble strips and measured the suspension losses with different bike setups. We tested tires at different widths and different pressures. Stiff forks vs. flexible fork blades vs. suspension forks. Padded handlebar tape. We found that wide tires at low pressures were most effective in reducing suspension losses. On the rumble strips, wide tires at lower pressures required only 2/3 the power of narrower tires at higher pressures. Suspension forks and flexible steel fork blades both had the same effect: They also reduced suspension losses compared to a stiff fork taken from a hybrid bike (shown above). The flexible forks were less effective than wide tires, because they had to deal with the front wheel moving up and down many times per second. Getting rid of vibrations at the source (the road surface) is the best strategy. Interestingly, the RockShox fork was more comfortable, but no more efficient, than the flexible steel fork of my Alex Singer. Some energy gets lost in the RockShox’s elastomer damping, whereas the undamped Singer fork has next to no internal losses. 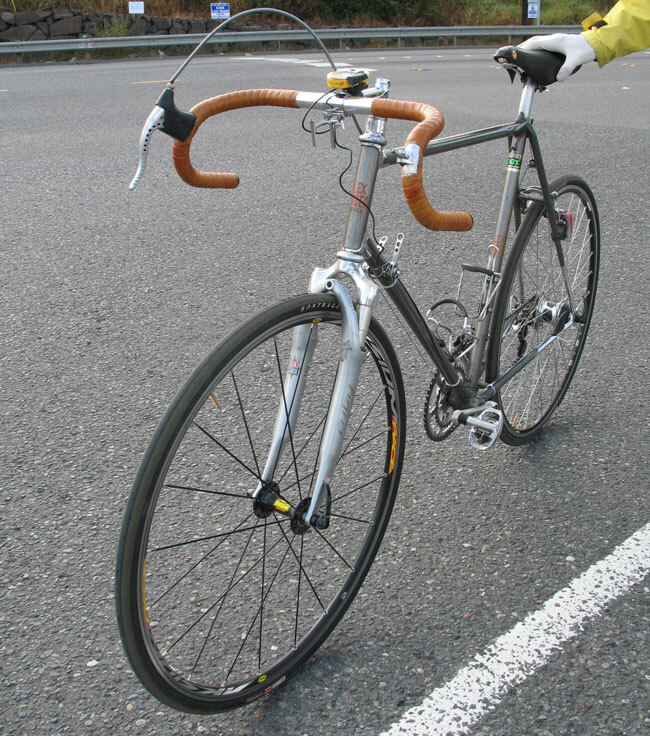 Padded handlebar tape did not reduce suspension losses. Once the entire bike is vibrating, the forces are too great to be absorbed even by a thick layer of foam. Interestingly, the rider’s subjective evaluation of comfort mostly matched the test results (with the exception of the suspension forks). The more comfortable the rider was, the smaller were the suspension losses. This photo shows an odd juxtaposition: my classic Alex Singer equipped with a RockShox suspension fork! As an interesting side effect, the comparison runs on the smooth pavement once again showed large performance differences between different tires. This confirmed the results of our roll-down tests of tire performance. We reported the results in the Autumn 2009 issue of Bicycle Quarterly (Vol. 8, No. 1). Keeping with the “rough road” theme, we also looked at the technology of bicycles for the Paris-Roubaix race, and we interviewed mountain bike pioneers Charlie Cunningham and Jacquie Phelan in that issue. In the latest issue of “Tour” (2012/8) they still publish a table showing that the higher pressure you have in your tire, the lower the rolling resistance will be. Don’t they read BQ;-) ? Yeah, that is a little bit funny. But they did a test several years ago. 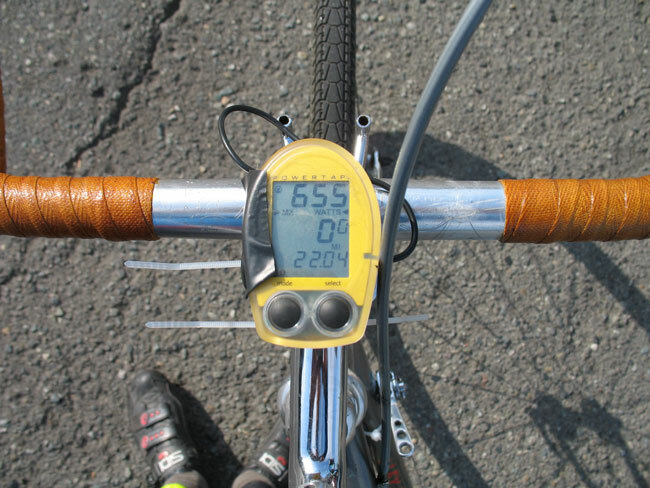 I can not remember now which issue, but somewhere between 2000 and 2003 I think, where they tested a bike with contiinental 3000 23 mm at 8 and 6 bars respectively, measuring the forces in the seatpost. 6 bars reduced the the forces in the seatpost significantly, but they could not measure the increased rolling resistance, that theory/other measurements) made them expect. As far as I remember, they suspected this to suspension loss. For that matter they did at test sometime in the nineties about high profile rims being hard to ride, an the conclusion was, that it had almost no importance. More than 90 percent of al suspension is in the tires. I tested “suspension losses” myself these days…. in my basement. Not on my bike obviously, but working with a jackhammer. While not slaving very hard myself, most of the actual work being done by the machine, I almost immeditely started to sweat like mad, just from the vibrations absorbed into my body. Is this why I get so hot and bothered mowing my lawn? The vibrations from the four stroke mower are hard work. I recently replaced a very stout fork with the intent of slightly lowering the trail of my bike (from 74 to 63mm). The change in handling was very apparent but I also noted that the bike felt quicker. I attributed this to the quicker handling that resulted from the lower trail. The only thing that bothered me was that the new fork was much smaller in diamter than the original fork and off the bike, it didn’t feel as “strong”. Now I wonder if this more lightly built fork is contributing to increased speed via suspension losses. It’s an interesting thought as I was considering getting a custom stouter fork made and now I’m thinking that might be a step backwards. I buy the fork thing, but I’d like some numbers. As a fork is much more trouble to replace than a pair of tires, and a few times as expensive, I’d like to know if the difference is statistically significant. I think it is relevant the the mountain-biking world is discovering that big tires equal suspension, and for many purposes with these tires you can eschew frame suspension entirely: witness the new Surly Krumpus, Salsa Mukluk, Surly Pugsley and other ‘fat bikes’. Sure is a lot lower maintenance and cheaper. I am going to start my comment by saying that I have not read the articles in Bicycle Quarterly and have no issue with the methods you used in the experiments. Maybe this is discussed in the relevant articles but from the content I have read on this blog you do not justify that this “suspension losses” hypothesis is indeed responsible for the power loss. I can think of an alternative hypothesis. That is the conversion of forward momentum into vertical momentum every time you impact a bump. The “suspension loss” hypothesis may contribute to the power loss, but it is more likely to be a combination of both of these mechanisms. Obviously isolating the mechanisms of the power loss doesn’t change the findings. Supple tyres, flexible fork blades, etc resulting in faster rolling over rough surfaces. The energy that goes into moving the bike upward would have to be returned when the bike comes back down. It cannot just go away. (When you ride up a hill, you get the energy back when you go back down, minus the amount lost to wind resistance and other losses.) The extra 290 Watts the rider puts out on the rumble strips must be converted to heat somewhere, since the bike is neither gaining elevation nor getting faster. That is the main point. Whatever it is, it slows you down a lot, and minimizing it through supple tires and so on will make you faster and more comfortable. Yeah, fair point on the vertical momentum. I still can’t see friction within body tissue absorbing that much energy. Does the literature you have on it give you some form of tool to calculate it’s contribution? This would be very handy for quantifying the effect of these losses. 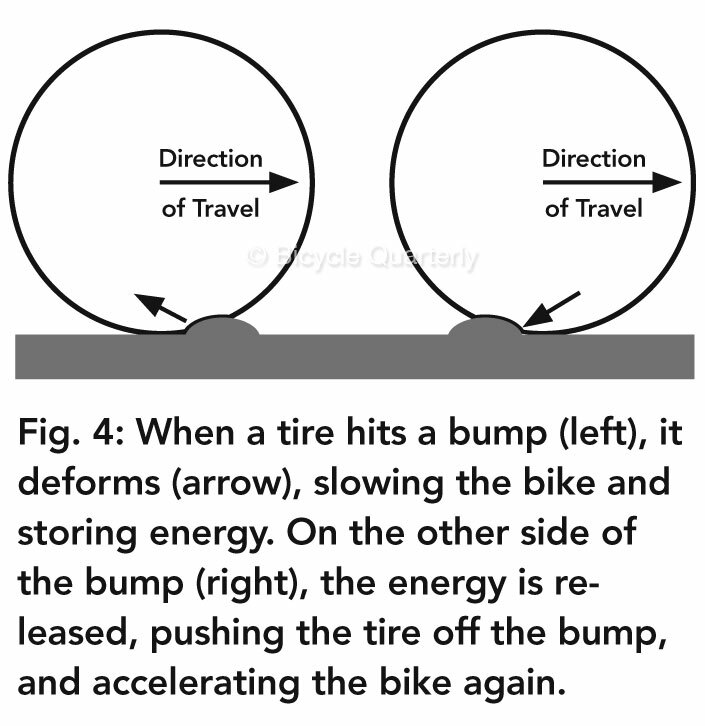 I have another theory for the power loss: a force resisting forward motion when your wheel encounters a bump. This force would be due to the angle at which the tyre contacts the bump, resulting in a force with both horizontal and vertical components. The horizontal component of this force will absorb momentum, effectively transferring it into the ground. Discuss . . . ? Like we said, the exact mechanism/s of the energy loss isn’t that important practically, but isolating them is the next step in the scientific process. Once they are established then it can inform future design an research. I still can’t see friction within body tissue absorbing that much energy. Does the literature you have on it give you some form of tool to calculate it’s contribution? Yes, the Army study found that up to 2000 Watt could be absorbed in tissue friction before the discomfort became painful. So our finding of 290 Watt additional suspension losses (the suspension losses on smooth roads aren’t zero) is only about 15% of the potential for energy loss in human bodies. We discussed this in the original article. That force exists, but the tire acts as a spring. It compresses when it hits the bump. When the tire rolls off the bump, the tire (spring) expands again and pushes back against the bump. Some energy is lost inside the tire to hysteresis (friction within the tire), but most of it is returned to the forward motion of the bike. If tire hysteresis was absorbing the 290 Watts, we’d see big differences between tires with supple and stiff sidewalls. We only see small differences. In fact, the difference between a smooth and a supple tire is about the same in absolute power terms on both surfaces (smooth and rough) – about 20 Watt. There is certainly something to Potato Man’s idea of vertical component of force accelerating the wheel/bike vertically. Sharp vertical acceleration is precisely what a “bump” is, in fact. So some of the forward energy is converted to vertical. Even if this is done perfectly elastically (i.e. no energy lost), there is no mechanism to convert it back to horizontal, as in the case of riding up and down a hill. You are not riding down the backside of these ridges. If things were perfectly elastic, the bike would bounce up and down forever after hitting a single bump. Oscillations would keep growing on the rumble strips, but no energy would be returned to horizontal. But the point is that the interactions of the bike wheel with the ridges are in fact inelastic collisions, so energy is dissipated. Surely, some is lost in noise, and the rest is dissipated in heat from friction of components flexing, muscles flexing/contracting, fluid friction inside the body, etc. If the bike wasn’t moving forward, this would be the case. However, the bike is moving forward. The tire is deformed as it hits the bump, and then springs back and pushes off the bump on the other side. I added a drawing that illustrates this to the post. The key to limiting suspension losses obviously is to have the tire (and to a lesser extent, the suspension components of the bike) deform, rather than move the rider’s body upward, and thus cause the large suspension losses. That is the secret why low tire pressures work well on the road, but show poor results in the lab (without the rider on the bike). The tire deformation has some losses, too (your ball doesn’t bounce forever), but they are relatively small compared to shaking the rider’s entire body. It’s like the difference of dropping a basket ball and a bean bag. The basket ball bounces back much higher (returns more energy) than the bean bag. I do not need to be convinced, even if the test methodology was impressive.. I have long been a fan of wider tyres and flexible classic forks. My custom loaded tourer has wide 559 tyres (now 26×1.75 Compass for the road and 50 mm (47 mm in reality) Marathon Extremes for the really rough stuff), and for a few years it has also had a sprung Brooks. That was better than an unsprung saddle, but with a bad back my physiotherapist still felt I needed something more for a pretty wild tour in Norway. So I fitted a Thudbuster ST seatpost. When I had originally specified the frame of the bike, I had made sure there was enough seatpost length (thanks to a mildly sloping top tube) to make this possible at some date in the future. The Thudbuster looks awful compared to the original Nitto seatpost, but an unsprung Brooks on a Thudbuster is quite a bit more comfortable than a sprung Brooks on the Nitto seatpost. Weight of the combination is about the same. I don’t know if it has made me faster (I doubt it) but it has certainly made me happier. All I still need to do is polish the awful black of the Thudbuster away to blend it in with the silver of the other components. Or alternatively read Alex Moulton’s extensive research on the subject … as he confirmed your theory/suspicions some 40 years ago …… hence leading to the full suspension design of all his subsequent bicycles . So now ….. the real question . Which overall is better for performance and comfort ? 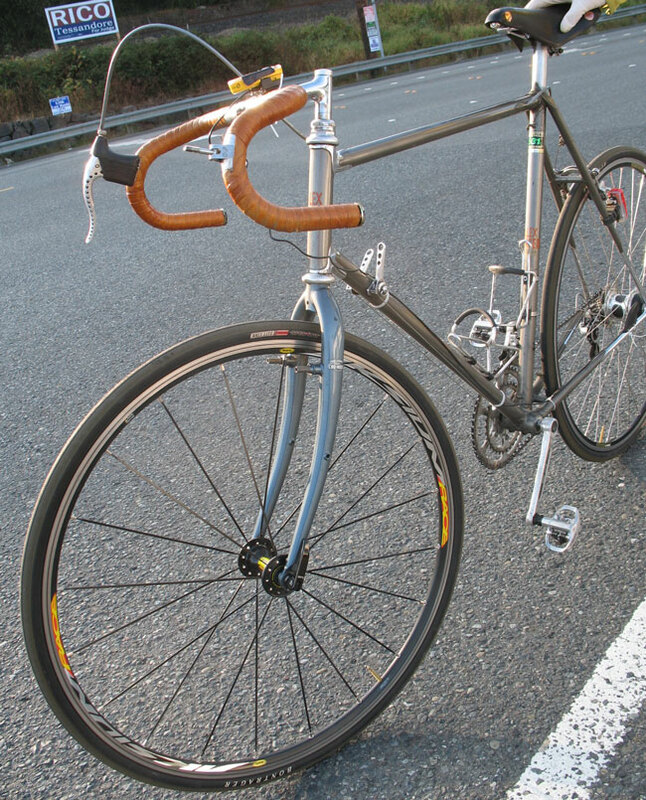 Wider tires on a non suspension bicycle …. or a high tech full suspended bicycle on narrower tires ? Seeing as how the TDF UCI etc has banned Moultons from all competition …… I’ll guess Sir Alex’s solution is most likely the best . I am glad you really like your Moulton. It’s a very interesting design. However, for suspension losses, the Moulton does not work well. The high-pressure tires don’t absorb the high-frequency vibrations, and the suspension cannot handle them, either. We were surprised how harsh-riding our Moulton test bike was on rough pavement. On the other hand, it was great on big hits, like roots that have caused the pavement to buckle. In those situations, the suspension works very well. The merits of the Moulton do not lie in superior performance. It’s a really neat design that is radically different from other machines. That makes it quite appealing by itself. Moulton’s own data shows that a “classical” bicycle was superior at frequencies >11 Hz. Rumble strips cause a frequency of about 25-40 Hz (bumps per second). Rough pavement causes vibrations of about 500 Hz. We discussed this in the Autumn 2010 issue of Bicycle Quarterly (Vol. 9, No. 1). Moulton’s flawed premise was that you needed high-pressure tires for low rolling resistance, and that you could make up for the harshness with a secondary suspension. That premise was accepted wisdom at the time, so it’s not surprising that Moulton based his design on it. Only recently have we re-discovered that tires roll as fast at lower pressures as they do at very high ones. Which overall is better for performance and comfort ? Wider tires on a non suspension bicycle …. or a high tech full suspended bicycle on narrower tires ? Our tests, as well as Moulton’s own data, answers that question conclusively: Wide tires cannot be replaced by suspension. So as you pose the question, wide tires on a non-suspension bicycle are much faster and more comfortable. Moultons are interesting. You are always aware of the suspension, and it’s different enough from a regular diamond frame as to make an otherwise routine and boring ride different and interesting. I find myself going out of my way to ride over manhole covers because they’re so much fun. What’s more, I’ve not seen anything that can compare with it on the /\ type tree root damage you find so often on bike trails. “Moulton’s own data ….” The graph you published is for a design that predates the New Series you tested by 40 years. This is like citing a Model T’s suspension response when criticizing a new BMW. Both are spring-and-mass systems, but the details are much different. In my opinion Moulton suspensions* absorb the range of vibrations that cause the most discomfort and difficulty with road holding. The suspensions work better on the road than one might predict theoretically. From riding alongside conventional bikes on chipseal, I know the suspensions are effective even though some vibration gets through. Certain TSR models can take tires up to 45~50 mm width — maybe worth a test? Suspension bob to some extent depends on training. A Moulton will show everyone whether you pedal squares. The bicycle you tested turned out to have defective suspension components which allowed massive suspension bob. *There are two major front suspension variants in current production — a linear steel spring vs rubber in torsion. The ride characteristics are different, and many riders find they prefer one over the other. Did they say how many faulty ones they have sent out? Did they issue a recall? As I see it, the Moulton single-pivot rear suspension – even the latest one – is an archaic design that was abandoned by mountain bikers years ago. The reason the mountain bikers abandoned these designs was that they could not control the suspension bob. I used to work as a technical writer for a number of mountain bike companies, including Girvin/K2, Rocky Mountain and a few others. During the 1990s, every year there was a new rear suspension design that promised to eliminate pedaling bob… I haven’t followed the latest designs, but it seems that they now have the problem under control, but with much more complex designs than the old single-pivot swingarms. I rode the bike for almost a year before I loaned it to you. I believe the suspension softened imperceptibly from ride to ride. I regret not detecting the decay. The North Carolina Moulton dealer has seen this happen with suspension elements from the period mine was made (2004). There is no question the new suspension components are superior. I think Moulton would have been more cooperative if you had held the review until Moulton had fixed the problems. No and no. While Moulton is very responsive when one contacts them directly, they are utterly non-proactive when it comes to keeping dealers and customers informed of problems and solutions. For this reason I think they deserved the black eye they got from your review. I am not aware this is published anywhere. The differences become obvious when one rides the major variants. But these are not mountain bikes, although they go quite well on hard packed dirt roads and trails. Compared to mountain bikes Moulton rear suspensions are very stiff and have a small range of travel. The archaic design has the virtues of simplicity and high reliability (the same can be said for the front suspensions). A more complex suspension is not required for road riding. The Trek with elastomers in the seat stays that you tested and liked is fundamentally a single-pivot swingarm. If we allowed manufacturers to delay publication of reviews, we’d never be able to publish even the slightest criticism of anything. From his work in the car world, Moulton surely knows that a review gets published based on the product that is sent for review. If the maker is lucky, they get a second chance of submitting a “fixed” product for a second review… as we offered. The Trek with elastomers in the seat stays that you tested and liked is fundamentally a single-pivot swingarm. I don’t know of anybody who has tested whether muscle reacts differently to vibration than fat. That would be an interesting study, but I am not sure how you’d measure this. A way to measure suspension losses in general could be to do a roll-down test with a three-wheel cart, on a real road surface. Once you put a solid steel weight on the cart, the next time, you use a bean bag. My hypothesis is that the bean bag will roll slower, because the friction between the contents causes higher suspension losses. I was thinking exactly this experiment for my 6th grader, when the science fair comes back around. OK, so how much energy is loss when a person rides either a pugsley or a moonlander, compared to a 700cx32mm bike? Hi Jan, I am very interested in your research but cannot understand your methodology. What is the relationship between watts and suspension loss? We use the same road for all runs. On that road, there are two surfaces: very smooth (pavement) and very rough (rumble strips). We go at the same speed, there is no wind, and the road is flat. Yet riding on the smooth pavement takes only about 40% of the power it takes on the rough. Where does the extra energy go? It turns into heat from friction caused by the vibrations. That energy is lost – hence its called suspension losses. Correct me if I’m wrong — If the PowerTap reads 473 watts, then does that not indicate that 473 watts was delivered to the rear hub? If not, then how can the PowerTap measure power that was not delivered through the drivetrain? I can see where the confusion might arise. If your chain has a lot of resistance, then you’ll put out extra power to overcome that “upstream” from the Power Tap. But that is not the case here. It’s not that the suspension losses occur between the rider’s legs and the rear wheel… but rather that the overall resistance the rider has to overcome with their leg power is going up. So if one of these resistances increases, the rider will have to put out more power. If you face a headwind and maintain the same speed, the Power Tap will read a higher number, because the wind resistance has gone up. The same applies to suspension losses. If the road gets rougher and you want to maintain the same speed, you’ll have to increase your power output to make up for it. Based on your description of suspension loss in the original article, the energy is consumed in the rider’s own body. That would be upstream of the PowerTap, would it not? Please explain how suspension loss occurs in such a way that it can be minored by the rear hub. Your explanation did not in any way clarify this, but instead only compared it to very different elements at play. The suspension losses are not upstream from the Power Tap. The rider’s body is like a bag of beans, or a tank of water, that is on the bike. The friction inside the body (bean bag, water tank) is just like any other friction, where pedaling energy is converted to heat. If the energy consumed due to suspension loss is exclusively within the body and converted into heat then it cannot transfer to the rear hub. The PowerTap is no more capable of detecting what you describe as suspension loss (friction between tissues) than it is able to monitor the energy used to blink your eyelids or contract your diaphragm. If 473 watts is displayed on the PowerTap (assuming it is accurate) then the force/energy was already delivered from your body through the drivetrain and into the hub, where it will then be transferred into the wheel to drive the bike forward against elements of friction loss which include rolling resistance, aerodynamic drag factor, and torque dampening due to the flexibility/pliability of wheel components. Again — suspension loss, as you had defined it, is not one of these elements. If you are certain that I am mistaken then I am eager to learn more about how this is possible, and will need more detail than an insistence that it is merely so, as was your most recent response. The question is, specifically, how the same energy that is wastefully consumed by your body due to suspension loss can also have made its way to your rear hub. …include rolling resistance, aerodynamic drag factor, and torque dampening due to the flexibility/pliability of wheel components. Again — suspension loss, as you had defined it, is not one of these elements. Suspension loss actually is one of those elements, no different from the other resistances. Imagine that the rider’s body is cut in half at the hips. The legs no longer are connected to the upper body. If you absorb suspension losses in the upper body, it’s the same as if these losses are absorbed by a tank of water on the bike. In both cases, the rider has to pedal harder to overcome the extra resistance. If that still doesn’t make sense, I suggest focusing on the “take home message”: Riding on rough pavement takes much more power than riding on smooth pavement. Smart equipment choices can save significant power. This effect is greatest on rough roads, but also significant on smooth roads. Jan, your “take home message” is common sense. Who among your readers did you assume was unaware that rough terrain requires more power to pedal through? You continue to simply insist that you are correct but offer no actual evidence or logic. Instead, broad comparisons are drawn and claimed to be in some way conclusive. Please focus on my specific question. I do not question whether or not it takes more power to roll through rumble strips, because that much is obvious to anyone. It is not even a question of whether or not suspension loss exists. I simply question how the PowerTap is able to monitor suspension loss based on your description of what it is and where it occurs. Your tank of water metaphor lacks any sense and science, as you have no proof that the water will cause an increase of wattage displayed by the PowerTap when compared to an object of the same weight, nor that the human body would behave in the same way as a tank of water. I’m not saying that this can’t be true, but I am pushing you to use actual science instead of storytelling. Metaphors and anecdotes are not what I’m asking for, so please do not continue to use them. It is frustrating to read your response when it effectively dodges the question. For example, how does the First Law of Thermodynamics specifically prove that the PowerTap is capable of detecting suspension loss? It makes no specific indication of this and is therefore not a proper answer to my question. Aside from answering my question, in the very least can you agree that the 290 watt difference observed in your experiment cannot conclusively be observed as purely suspension loss? What else is it if not suspension losses? The bike does not gain elevation (no potential energy gain), nor does it get faster (kinetic energy gain). The only energy gain that is left is heat due to friction. Most of that friction must occur within the rider’s body – the rest of the bike cannot heat up much by vibrating, as it’s an undamped system. There will be some extra losses because the tire deforms more as it conforms to the road irregularities, but that does not consume 290 Watts. Another thing is what do you think you feel when your body vibrates? It is uncomfortable. And it’s not just uncomfortable on the contact points, but everywhere, even though there are no direct forces hitting your body. Why is it uncomfortable everywhere? Because your tissues are rubbing against each other as they are shaken. Rubbing means friction, friction means energy is converted to heat. I am pushing you to use actual science instead of storytelling. One way of doing science is to explain an observation by zeroing in on it, through eliminating other factors. When only one possible factor remains, then it must be the determining factor. By the way, the original article mentioned research done by the U.S. Army in the 1960s, where they measured the energy consumed by people sitting on seats that vibrate, and found that human bodies could consume up to 2000 Watt before the vibrations became too painful to endure. So the fact that suspension losses occur has been documented elsewhere – it’s not a new concept. If a tank driver’s body can cause 2000 Watt resistance, it’s not surprising that a cyclist’s body can cause 290 Watt resistance. In an effort to simplify this discussion, which appears to have gone everywhere (including to a 1960’s experiment that involved sitting on vibrating chairs), please answer all of the following questions as concisely as possible. You may have already answered most of them but the sum of all your explanations did not form even a remotely scientific conclusion, so I want to certain that I am not missing something critical. 1. What is suspension loss? 2. What and where is the direct effect of suspension loss when riding a bicycle? 3. What is the path of travel for energy that is ultimately lost in this way? 4. How is it that the PowerTap can detect this? 5. Other than suspension loss, what other factors explain higher watts needed to maintain a specific speed over rumble strips compared to smooth pavement? I admit, at this point I have lost confidence that your experiment was in any way scientific and feel that you do not possess enough applicable knowledge to support the claim you have made. In my years of experience working with ergometers it appears that the problem in your experiment is a common misunderstanding of how watts are monitored by PowerTap and what they actually represent. I am, however, eager to be corrected if my understanding is wrong, as the additional knowledge will be of great benefit to me. Energy lost due to vibration of various parts of bike and rider. Like any energy loss, it slows the bike down. I am not familiar with the concept of “path of travel for energy.” It seems that you are looking for a direct link, like a chain, but that is not required to slow the bike down. Look at those “friction-less” lights that don’t ever touch, yet they create electricity and thus also resistance. See 2. We kept the speed constant, so the rider had to put out more power to make up for the suspension losses. The PowerTap measures this. I cannot think of any. If you can, please let us know. I feel that your concerns now have been discussed at length, and I suggest you refer to the book Bicycling Science for more information about what suspension losses are and how they work. If you have any real concerns about our research after reading the article in Bicycle Quarterly, please submit your comments to the magazine. The magazine sends these comments to review, and if the reviewers think there is merit in them, they will be published. Jan, you are the editor of Bicycle Quarterly, the author of the article, and the person responsible for conducting the experiment. I have no interest in contacting anyone else with the magazine regarding this specific discussion. Your definition of suspension loss in response to my question is different than how it was defined in the original article. The latter describes it as absorption of energy by the rider’s body, whereas you now mention the energy is also lost in parts of the bike. I reviewed your article multiple times and could not find any note that suspension loss occurred anywhere other than the rider’s body, and instead only notes that different bicycle components could change the way the riding surface affects the rider’s body. This sheds some light on the subject for people like me who read the article for what it states and not what it may imply in reference to knowledge not available in the article itself. It does not, however, justify the absence of many factors that were ignored in the experiment. 1. Insufficient traction due to only partial contact of the tire’s rolling surface, resulting in a skid that generates less propulsion but demands measurable watts. Any surface that skids, regardless of whether it is smooth or bumpy, will require more watts than an otherwise identical surface that does not. 2. Rolling over the ridges which are in effect tiny hills, requiring additional watts to overcome. The wheels are literally falling into pits and climbing out, and as you can imagine if this constantly occurs there will be a tremendous amount of additional effort needed that is independent from concussive forces and vibration. 3. Bouncing, while also being a factor of suspension loss, will increase the amount of watts required to achieve a specific speed due to the effort required to turn the crank even when no contact is made with the road. This effect is independent from suspension loss but can be observed by turning the crank with the bike lifted from the ground and watching the ergometer display. These three factors can also explain much of the difference in watts monitored during each of your individual trials. The data you obtained as a consequence of this experiment is not an exclusive measure of suspension loss and therefore does little to prove anything in the name of science. It does, however, at least demonstrate that rumble strips make poor bike paths and larger/softer tires can make them more tolerable. Is the difference of 290 watts at 16MPH between smooth and rough pavement an isolated measure of suspension loss? No, clearly not. Could suspension loss contribute to that difference? Yes, if it is lost downstream of the ergometer. Does energy lost in the rider’s body due to suspension loss affect the ergometer? No, and in fact the rider’s body probably mitigates the effect of suspension loss over a rough environment in the same way that wider and softer tires do by absorbing the bike’s inefficient jitters and supporting a more consistent contact between the bike and the road. I encourage comments and criticism from anyone reading this blog. I was told that other users were disturbed by my persistent and interrogative comments and asked by Jan not to post further, but I believe that this is an appropriate topic for open discussion and any opinions or observations should be voiced. Individuals who requested that I should be told not to comment are warmly welcomed to tell me why. 1. Insufficient traction due to only partial contact of the tire’s rolling surface, resulting in a skid. If a tire skids while going at constant speed in a straight line, there is very little traction, hence very little friction, and very little power lost. 3. Bouncing, while also being a factor of suspension loss, will increase the amount of watts required to achieve a specific speed due to the effort required to turn the crank even when no contact is made with the road. When the bike is lifted off the ground, it takes very little effort to maintain a constant wheel rpm. All the factors you mention do not amount to much. Similarly, any energy absorbed in the bike does not amount to much, as there isn’t really any place that can absorb the energy. That energy must be absorbed in the rider, and previous research has shown that vibrating bodies absorb significant energy. Whether the energy is lost downstream from the ergometer or upstream doesn’t matter – conservation of energy means that any energy loss must come from somewhere. If the rider travels at constant speed, and additional energy is lost anywhere in the system, the rider must increase their power output to keep the speed constant. As I wrote earlier, you are welcome to submit your comments to the article. We’ll send it out to review, and if the reviewers believe that you are onto something, it will be published. I study the flow and deformation of materials for a living (as a food scientist). So its natural I’d think about this issue of energy loss from a rheologist’s perspective. You want to do your roll-down experiment with water as the added payload, rather than a bean bag. Water is much more purely viscous than dry beans, and the kinetic (vibration) energy will be dissipated much more completely. The human body is mostly fluid, and when vibrated, the energy is lost due to viscous heating (probably not detectable as temperature rise, except maybe in those tank drivers you’ve written about elsewhere!). A steel spring, on the other hand, is purely elastic, and will return all input energy of vibration when released. A rubber band has both elastic and viscous components to its deformation behavior, as do rubber tires. They will lose some of the input energy as heat, and return some in forward motion. I’d guess that heavy stiff tires are slow because they transmit more energy to the person riding the vehicle and that energy is absorbed as heat and thus lost to forward motion. Flexible tires absorb more of that vibration and return it as forward motion, but I’d guess the payload energy loss is more important. Shock absorbers have springs (good!) and fluid dampers, which may make for better dampening action (on the big bumps) but also absorb energy on all the little bumps and lose it as heat. So they work great with a powerful energy source in a motorcycle or car but not with us wimpy human engines. This is an interesting test of extremes, but it seems to me rumble strips are not indicative of a surface that would be commonly ridden on. The frequency may be similar to some bumpy surfaces, but the amplitude seems beyond what a rider would typically encounter on a road ride with the exception of cobbles or badly washboarded gravel – which are not the norm for most . I would be curious to see how a rough surface that you may actually ride on for an extended period (like the chip seal you originally sought out) would fit in to the mix. Would the higher frequency make up for the smaller amplitude of the roughness and create the same loss? Which matters more? Over how long a stretch do you perform the test? is it practical to roll out your own rough surface? Or would running tracks work? All are the same size and all are level, but there are many different surfaces used to pave them ranging from very smooth rubberized asphalt to cinders. You are right – rumble strips are an extreme surface. As such, they allowed us to isolate factors that might be hard to isolate on normal roads. We showed that suspension losses can be very important. We found that tires are best in reducing them, followed by flexible forks. We also found that padding handlebars doesn’t reduce suspension losses (nor increase comfort). Just from riding over these surfaces, I know that rumble strips are extreme. On narrow tires, it slows the bike immediately. Chipseal slows you down, too, but much less so. 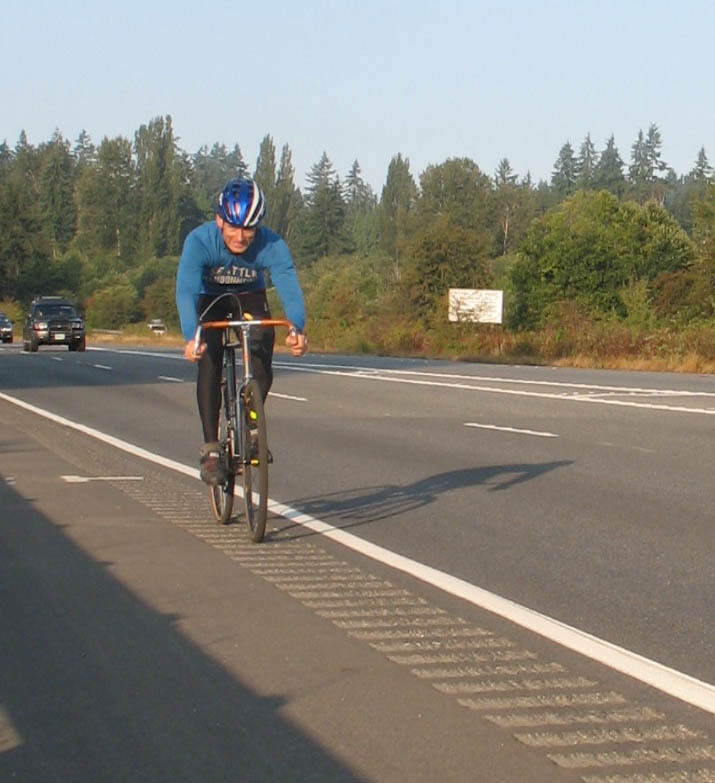 Riding over the rumble strips for our testing – 3 repeats for each setup, the test section was about 1/4 mile long, for a total of about 12 miles of rumble strips – was very, very tiring. Making our own surface would be nice. Ideally, we’d find an indoor space about 1/4 mile long, on a slope like a soapbox derby track (steep at first, then gradual downhill). We’d pave three or four different pavements next to each other. There’d be no wind, constant temperature – ideal conditions. I’ve even considered an abandoned railroad tunnel, which would have the benefit of constant temperature. However, the cost of any of these ideas is prohibitive. And really, it’s not needed. We wouldn’t get any different or better results, it just would be easier to test – no waiting for calm days without much temperature change any more! Sounds like a new diet – All you have to do is ride 15mph on 23mm tires over rumble strips and you’ll burn 3x the calories. Hands might be too numb to even try to pick up food for a few hours too. My guess is that you would burn more than three times the calories. Maybe this was mentioned somewhere, but I suspect that pedaling efficiency is decreased on the rumble strips as well, to make matters worse. This effect would indeed be upstream from the power tap. So from the rider perspective, it would seem like even more work than the 2.5 to 3 times increase in power necessary to maintain a given mph on the rumble strips. Maybe one could measure the additional rider workload by comparing heart rate at a given wattage on smooth vs. rough pavement (of course, there would be other variables that could influence heart rate). It’s interesting that riders in Paris Roubaix and other cobbled classics tend to push bigger gears at lower cadence on the cobbled sections in an effort to maximize pedaling efficiency. Just a small detail, which I have experienced on coble stones. That sometimes You hit them and everything is shaiking and You loose speed immediatly. Other times and my experience says low cadence at speed. It feels as if You float over them. Could cadence be a factor? I think cadence probably is a factor. Whether your muscles are tense (low cadence) or relatively relaxed (high cadence) may change how much energy they absorb in suspension losses. I think I have read that the consensus approach among pro racers in the cobbled classics is a big gear and low cadence (for the cobbled sections that is). Speed on cobbles, or any regular surface like rumble strips, might also be a factor. All mechanical systems have resonances, and their responses to different frequencies can vary widely. I’ve found that my body seems to lake less of a beating when I go faster on some cobbled streets. I think the original post here gave the speed as 16 mph (“… found that the additional power required to maintain 16 mph was 290 Watt.”). Will you elaborate on the speeds used in your testing and how they were selected? We did two tests: One on the “standard” rumble strips at 16 mph. Why 16 mph? Because that was the highest speed I could maintain during repeat runs. The goal of that test was to get an idea of the maximum losses that can occur due to vibrations in an extreme situation. Then we tested again on shallower rumble strips to determine the impact of different equipment. Here, we could test at higher speed, because the rumble strips were not as deep. We chose that speed because it was a speed that the tester could maintain relatively consistently. (The vibrations were too extreme to see the readout from the computer.) We then did a regression analysis to be able to compare all the measurements. Some of the properties of larger tires at play in suspension and handling are actually a result of the lower pressure, and not larger size per se. Of course, larger tires can be run at lower pressures… But if we assume that tires are perfectly supple, which I take to mean that they do not resist bending or folding force in any direction, and also assume that the suppleness does not change with deformation, and that the tires have enough air to not “bottom out” on the rim (neglecting for a moment how good or bad these simplifications model actual tires) then the area of the contact patch of a tire for a given rider and bicycle weight will only depend on the air pressure. The contact patch will be circular under these assumptions also. I have been experimenting with lower pressure in 700 x 25 and 700 x 28 tires, and I like it- they ride great. (I don’t like the mushiness when stomping on the pedals out of the saddle, however.) Regarding suspension, one difference is that the higher volume of a wider tire will case the pressure to increase more gradually when it hits a bump, so you will feel the bump less. It is probably true that the above assumptions hold to a less degree when you hit bumps, and the approximation gets poorer more quickly for smaller tires as the tire deforms. I also do not take into account the stretchiness of the casing, which must play some role. Perhaps some of this was discussed in the original BQ article. You are right – the biggest factor in comfort (and thus suspension losses) is pressure, not width. But of course, you cannot run a 25 mm tire at 40 psi without risking pinch flats, so the two are inevitably linked. Casing stiffness is a factor that often is underestimated. Even at the same pressure, a wider tire is more comfortable and faster, because the casing doesn’t need to flex as much (wider contact patch) to support the load. The pressure increase when hitting a bump is negligible. The air volume of the tire decreases by less than 1% even if you bottom out on the rim. Those effects are discussed in Gordon Wilson’s Bicycling Science. The anecdotal story I’ve heard too many times to count is from the loaded touring world. It’s pretty common (anecdotal!) feedback that a loaded touring bike with the gear all solidly lashed down rolls faster and handles better than a bike with the gear moving around. I’ll add that to my list of 6th grade science project ideas. Stuff panniers hard as a rock with clothing and do a roll down test. Then replace the clothing with water bladders of the identical weight and repeat the roll down test. If the bike is slower with the water filled panniers, then the frictional losses in the sloshing water is the culprit. I am not sure water or rocks would be good materials for this test. For example: if you tightly wound a bunch of string into a ball it would bounce when dropped. If you then piled up the same amount of string like spagetti, it would not bounce at all. Water is relatively incompressible so can act like a solid in some cases, but absorbs very little energy while sloshing around. Rocks can move around and stretch a bag, creating a strong damping effect. Try bags full of actual clothing and gear packed sloppy in half full, loose and floppy bags. Then pad out the bags with cardboard (to account for wind drag) and bolt weights directly to the frame. The difficulty in this type of test is finding the energy loss. A shifting load may dissipate the riders efforts within the vehicle, rather than slowing the bike. It certainly would require more core strength to control a shifting load and stay upright. A bike may roll just as fast and far when coasting, but the rider would still percieve more effort to propel it. On the other hand, a load acting like a damper may increase suspension losses, while a solid mass would tend to return more energy on the down-hill side of bumps through the tires. In that case, add lots of weight and see if there is less suspension loss. Interesting article and discussion, I’d be interested in hearing more on your thoughts regarding the design of steel forks. There’s no doubt in my mind that your custom Singer fork rides like a dream (comfort, handling,) and I was wondering if you could highlight some properties that contribute to this. Some of us are on more of a budget and still want to stick with steel, basically I’m wondering what we should look for in a comfortable steel fork–construction, crown design, curve shape, blade taper, etc? We tested the compliance of forks (Bicycle Quarterly Vol. 6, No. 3), and found that they do flex significantly. Obviously, the diameter of the blades is important – smaller allows more flex. Beyond that, more rake also allows more flex, and having the bend closer to the bottom of the blade also appears to make a difference. Kaisei is making a special fork blade for Toei that has the same diameter as the Singer fork. Riding a Toei and my Singer back-to-back on a rough chipsealed road (same wheel used on both bikes), we could not notice a difference between the two forks. Compass Bicycles now sells the Kaisei “Toei Special” fork blades. I notice that you did not play with variables at the rear end of the bike. BQ often discusses the benefits of flex in forks, but almost nothing about seatposts. With 60-65% of your mass on the rear wheel, the triangulation of a diamond frame, and direct coupling of body to saddle (in a delicate place), surely small changes here will make a bigger difference than the fork, and would be easier to try. How about inflexible vs. flexible seatposts, suspension saddles, suspension seatposts (thudbuster in particular), amount of seatpost exposure and material, how much of the seatpost is actually physically clamped or length of contact inside the frame? The difference between damped springs and undamped springs should also be more pronounced. How does a classic steel frame with short seatpost compare to a modern ultra stiff frame with long seatpost in terms of rear end suspension effects, if any? Is there a forgotten, simple and effective secret to an efficient and comfortable bike here? My own experience is that with some combinations, often contrary to expectations, I wind up standing over more and smaller bumps than with others. It certainly takes a toll, both in energy and fun. It may affect pedaling efficiency, which may not show up on a power tap. There are many things we could have tested. However, I question your assumption that a rear suspension will make a bigger difference than a front suspension. When the rider pedals hard, they hardly touch the saddle. The rider’s weight is carried on the pedals, which are almost right under the saddle. Hand comfort is a bigger issues for most avid cyclists. In fact, after riding more than 10 miles on the rumble strips, my behind was fine, but my hands, arms and shoulders ached all day. If your weight distribution was typical, saddle choice surely would not be as important as it is for so many of us. I also suspect the severe conditions caused you to shift even more weight to your feet and handlebars than under more typical riding conditions, resulting in even more soreness and tiredness and more benifit from front suspension. And if you are sore and tired, would you not begin to rest more weight on the saddle and stand less often (if it were tolerable to do so), thus gaining more benefit from rear suspension late in a ride anyway? My old bike is a 700c full suspension road bike with 23mm tires, which makes such rumble bumps rideable while fully planted in the saddle. When riding my new rigid bike with big tires, I do miss the rear suspension on bad roads, but I never miss the suspension fork. The difference is in the frequency and magnitude of bumps. Mechanical suspension handles big bumps, tires high frequencies. Big bumps hit your backside unless there is a gap, weighted or not. High frequencies don’t seem to come through as much. Standing takes energy. Arms deflect easily on big bumps, but high frequencies cause fatigue and soreness. Unlike standing, letting go is not an option. So forks have little benefit, but over time rear suspension can make a real difference on fatigue. So I think rear suspension is a subject that would be of interest to your readers. Maybe the best test is different, and the result is about fatigue, not strictly rolling resistance. Maybe it is subjective by nature, but I am a little alarmed that you would dismiss anyone who does not set up the way you do, pedal the way you do, or ride at your level, which would include the vast majority of your readers. John, (Mr. Duval), You make simply excellent points. Points that Jan simply cannot disprove (nor the want to) at this point. Indeed as the person who donated the rear-suspension Trek pilot to BQ all the way back in 2006 I had begged Jan to test many aspects including the some of what you have brought up- however his response is pretty much the same as he gave you- he says riders stand up and don’t need rear suspension. And further that rear-suspension is not something his editorial board deems necessary to entertain- this now going back 6 years. Indeed I openly think Jan editorial board does not represent riders who ride rear-suspension. Its strange but even the cover of the magazine that marks the start of this very thread has an article in it where Jan interviewed Charlie Cunningham who in that issue, told him that passive rear-suspension could be worthwhile and that Jeff Jones was building that kind of bike. When I told Jan to follow up on this he dismissed it outright. The mass adoption of both passive and semi-active rear-suspension (at the seat and at the pedals) jibes with your own findings, however Jan is still not impressed with this. This may explain why he replied to you just above saying “I question your assumption”, indeed that is not a very thoughtful (or particularly respectful of your actual use case and experience) rebuttal; nor is his non-response to your later yet more insightful post. With all that said I think that Jan is a very smart man (more imaginative and with a better ability to read the bigger picture of everything required to (like the smartest scientists do) understand the bike and rider as a whole than the rest of his “editorial board”) — especially in the area of conceptual thinking matched with the analytical thinking (not to mention practical understanding of the subjects) required to substantiate the large number of creative ideas he comes up with. One day Jan should transfer his abilities and understanding of French technology to the wider spectrum of new cycling technology that is becoming commonplace in new consumer and race bikes. The title of his publication is no longer Vintage Bicycle Quarterly. We have tested a number of suspended bikes, including the Trek and the Moulton, so we certainly are open to the idea. One day Jan should transfer his abilities and understanding of French technology to the wider spectrum of new cycling technology that is becoming commonplace in new consumer and race bikes. Around here, I don’t see suspension on the bikes ridden by avid road cyclists, so I am not sure whether it qualifies as “commonplace.” What I see mostly are carbon racing bikes like the Calfee and Trek Madone that we have tested. I am not so sure Jan. I may not be such a powerful rider (I am not), but I was very glad I had chosen a sloping top tube with enough room for a suspension post when I would need one. The Thudbuster ST made a big difference to my ageing back. It did so on smooth roads (like fatter tyres are also beneficial on smooth roads), but all the more so on bad roads. Of course, this was in addition to a nice flexy frame and wide tyres. I am not sure it made me faster, but certainly less concerned about going fast. This was also born out in some scientific work in Germany that you may care to look into. I can’t find it now, but it was done I think at the Sporthochschule. The brief summary is normal levels of vibration in bicycles are in fact potentially harmful to the spine, that rear suspension reduces this very much, but that a suspension seatpost also provided a very meaningful reduction. They did a lot of measurements, and I think more recently also on the effect of fatter tyres. Admittedly, this was all about health effects and comfort, but apart from the obvious relevance of that, it is likely to also effect performance. Thank you for sharing your experiences. I agree that rear suspension does provide comfort and speed benefits, however, from my experience, front suspension is at least as important. A lot probably depends on your riding position, too. I am not familiar with the German study, but the average German cyclists sit very upright on their bikes. This will put more weight on the bottom and less on the arms/hands. If you have a more performance-oriented position, then your spine is inclined much more, and thus jolts on the rear of the bike do not compress your spine as much, if at all. This spring I went on a morning ride at Rock Cut State Park with 2 of my friends. The trails were mud so we took the road instead. My friends rode cross bikes with medium width tires. I rode my rigid 29er SS with WTB Exiwolf 2.3″ tires, 32 psi rear 28 psi front. I could easily roll down the hills as fast or faster that they could, strictly coasting no pedaling. Big tires roll fine. Which is indeed why I try to protect my spine by not sitting too upright. From what I remember the German study was for sporty (mtb) riding, with torso’s at about 45 degrees. So not as low as you do, but not sit up and beg either. I agree a fexible fork is very important. Steve has it right. Moultons have an exquisitely lovely ride and go wonderfully on bad pavement. While I don’t aim for manhole covers myself, I don’t bother much to avoid them and other pavement imperfections. On an unsuspended bike I get into trouble on familiar roads because I am so used to ignoring the lumps and bumps. I have wondered where to find his work. Can you provide citations and a library that has it? That was a codification of the de facto situation. Competing teams boycotted races the Moulton team entered. There are a few Moultons raced in triathlons that tolerate unusual bikes. Dr. Moulton. He does not have a knighthood. From what I found, the UCI banned small wheels and suspension in the 1990s. The Moulton had more than 30 years to prove themselves in competition. I haven’t found any evidence that “competing teams boycotted races the Moulton team entered.” If that had happened, the Moulton team would have walked away with the victory, yet there isn’t a single major race that ever was won on a Moulton, from what I can see. Contact Gilbert Anderson. He can tell you plenty. From riding a recumbent the meaning of suspension losses is greatly felt on roads less than very good. On choppy crushed stone on tar roads your horizontally arranged legs will shake and chatter with the road surface and being able to put the power through the cranks is annoyingly harder. For me, wider tires are a huge difference where they are pumped up hard initially and then releasing air in small doses along the road until the higher frequency vibration has gone. My body is my instruments. (sigh)! Where is the perfect bike? As a recumbent rider myself I have suspected suspension losses are a reason recumbents do not do as well as it seems they ought to on paper. I have one of Jan’s 40 mm 26″ tires on the front of my Bacchetta Ti Aero. I use 40 psi in it. It is an excellent, fast tire, and far more comfortable than the 650C tires the bike was designed for. I am thinking of having the rear brake altered so I can run one of these on the rear wheel.